Beth and Steve Morris (Colleen McGrann and Christopher Parker) contact an Intervention-like television show for help with their daughter, Carson (Lara Vosburgh). Carson went from a well-behaved child and a good student to a drug addict seemingly overnight. Producer Suzanne (Kate Whitney) arrives at the Morris house with camera men Jason (Morgan McClellan) and Tim (Brian Flaherty) in tow. They interview the family and get some footage of Carson, who certainly acts strange and doesn't really hide her heroin use. It's decided that Carson should be checked into a rehab clinic run by Dr. Pretiss (Richard Wilkinson). As the drugs begin to leave Carson's system, her behavior becomes more savage and her language more disturbing. During the process, Jason has found himself drawn to Carson and he feels protective of her. He begins to check into her background and discovers a dark secret. Despite a great idea and a better than average reason for "found footage" to exist, Inner Demons can't maintain its momentum. Once we learn what is going on with Carson, we simply wait to see when she is truly going to go off, and it takes far too long for something to finally happen and when it does, it's fairly weak. In short, the movie needs more action. To be fair, the revelation of how Carson came to be in this condition is somewhat interesting and the ending contains a shock, but the second half of the story clearly needed more work. The movie is somewhat similar to The Taking of Deborah Logan, but that film was one of the rare "found footage" which was able to maintain its momentum throughout. Inner Demons is worth checking out solely for its ingenious idea, but don't expect a consistent film. 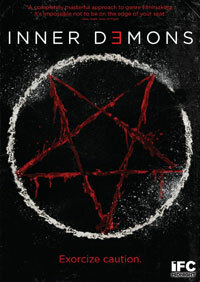 Inner Demons has no concept of what detox really means on DVD courtesy of IFC Films. The film has been letterboxed at 1.78:1 and the transfer is enhanced for 16 x 9 TVs. The image is sharp and clear, showing no overt grain and no defects from the source materials. Keep in mind that we do get the typical "found footage" "issues", such as the aforementioned static and interference, as well as rolling screens and dark footage, but this is intentional and has nothing to do with the transfer. The colors look good and the daytime scenes have nice depth. The DVD carries a Dolby Digital 5.1 track which provides clear dialogue and sound effects. The track does a fine job of highlighting sounds coming from off-screen, and we get solid subwoofer effects, both of which add to the aforementioned use of sounds to create jump scares. The lone extra on the Inner Demons DVD is a TRAILER for the film.